Meeting: Hospital Medicine 2016, March 6-9, San Diego, Calif.
To recognize Strongyloides stercoralis hyperinfection as a fatal cause of diffuse alveolar hemorrhage (DAH) in immunocompromised individuals. A 47-year-old Hispanic female with MPO-ANCA-positive pauci-immune RPGN status post plasma exchange now well controlled on Cytoxan and prednisone presented with dysphagia, nausea, abdominal pain, and dyspnea on exertion for the preceding three days and new onset hemoptysis. She denied fevers or sick contacts. She had emigrated from Honduras 21 years prior but had no recent travel history. On admission, she was hypotensive, tachycardic, and hypoxic. She appeared acutely ill. Examination was significant for bibasilar crackles. Her labs were remarkable for eosinophilia (8.0%) and acute anemia with a 5 g/dL decrease in hemoglobin from baseline one week prior. CXR showed interstitial edema. CT of the chest showed worsening bilateral ground-glass opacities and bibasilar consolidation. An emergent bronchoscopy demonstrated areas of submucosal hemorrhage and serial BALs revealed progressively bloody return, consistent with diffuse alveolar hemorrhage (DAH). She was empirically treated with pulse dose steroids for possible vasculitis flare; however, bronchial washings returned positive for Strongyloides larvae and she was subsequently started on ivermectin. Her hospital course was complicated by large volume hematemesis requiring intubation. EGD demonstrated gastritis and duodenitis; biopsies revealed severe Strongyloides infestation without microscopic evidence of vasculitis. Renal function remained at baseline. She was diagnosed with Strongyloides hyperinfection complicated by DAH. Albendazole was added as an adjunct therapy with resolution of symptoms. 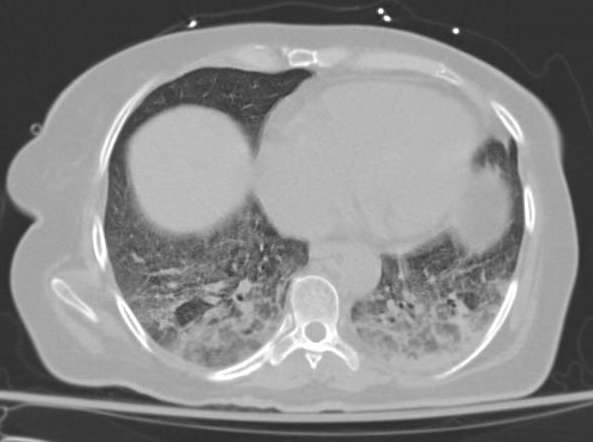 Strongyloides hyperinfection can present with pulmonary manifestations including asymptomatic infiltrates, dyspnea, cough, an asthma-mimicking syndrome and less frequently, DAH and respiratory failure. Hyperinfection carries a high mortality rate of 70-89%. There have been very few cases of hyperinfection complicated by DAH reported in previous literature. The Strongyloides parasite is endemic in much of Latin America but complications as seen in our patient are often not encountered until initiation of immunosuppressive therapy. Hyperinfections have been described as late as 64 years after a patient has left an endemic area. Our patient likely had a chronic, previously asymptomatic Strongyloides infection which was unmasked during this presentation. The diagnosis is typically made with a positive stool ova and parasite; multiple stool samples should be submitted to increase sensitivity. In hyperinfection, larvae can be seen in bronchial washings. Ivermectin is the preferred initial therapy. Immunosuppressive therapy puts individuals with chronic and asymptomatic Strongyloides infection at risk for hyperinfection, dissemination, and poor outcomes. Screening for infection should be considered in patients from endemic areas and treatment should be completed prior to initiation of immunosuppressive therapy. Mao T, Kaul B, Pywell CM, Bandi V. A “Strong(Y)” Case of Diffuse Alveolar Hemorrhage. Abstract published at Hospital Medicine 2016, March 6-9, San Diego, Calif. Abstract 664. Journal of Hospital Medicine. 2016; 11 (suppl 1). https://www.shmabstracts.com/abstract/a-strongy-case-of-diffuse-alveolar-hemorrhage/. Accessed April 25, 2019. « Back to Hospital Medicine 2016, March 6-9, San Diego, Calif.